Riding a bicycle is not only a hobby. It is also a passion. This is a way of life. If you breathe and live riding, then there is a possibility that you like to involve your baby. Suppose you like to bring your baby to a riding or would like to make a tour with tricycle; you must buy a little helmet for your kid. The reason is that it will give full safety for your child’s head from injury or accident. The only problem with the helmet is that they are normally made for the school aged kids. Unluckily school aged child normally have a bigger head than your baby. The head of your child is bigger; you have to hunt the perfect size helmet for your little kids. This is the place where the guide comes in. We cover things to search for since choosing a bike helmet and take a look at some of the best bike helmets on the market. Here we will discuss various features of the bike helmet. Before you like to buy a helmet, you must consider the following factors to get the best one. If you like to choose a helmet for your baby, you need to consider the size of the helmet first. Most of the brands make helmet according to the age of the child. This is best. But my one-year-old child is smaller than usual; surely the helmet would be useless. For this, size guide is not a great thing for such occasion. What is the way to measure the baby’s head size for using a helmet? As the size of the heads is different according to the age verification. Take a measuring tape, and then hold it around the thickest part of the head. The measure, 1 inch above the eyebrow. In this way, you will get the right measurement and now move to buy a helmet for your baby. A lightweight helmet may be a great helmet for a child of this age. You should not buy the hard shell helmet. Try to get a soft shell helmet. You may get confused to see the both of them. Now have a close look at the two types. The mold gets the name from the construction. This is the lightest helmet in this type. The foam is injected inside with the mold while the hard shell may be inside. Therefore, the name is mold toddler helmet. The helmet is well vented, lightweight. There are various interesting types of this helmet on the market. You can choose your dear size for your toddler. Hard shell helmet is made from 2 various pieces. The foam and the hard shell are laminated along with. The helmet may seem smaller but are best suited for sports instead of bike riding. It is very important to note that no helmet is safe well. The main difference is ventilation and weight. Air vent gives fresh air to the baby or the toddler’s heads at the time of riding the bike. It will resist the heads to become uncomfortable or hot at the time of riding. Believe me; you do not like to give the chance to become the baby’s head sweaty, irritated and hot. All modern helmets for the toddlers come with air vents better than the other normal brands. More vents mean better air circulation. Suppose you are living in the hot environment, you will like to get more vents. Some helmets come with integrated bug mesh to stop bugs from flying towards the vent. On my route, I see no enough bugs to justify the necessity of bug mesh. If you have more bugs near your home, you have to buy more mesh. There are visors in some toddler helmet. The visor saves the eyes of the sun from the sun’s rays. The visor has a drawback. The child likes to see around. But for this visor, they cannot see the sights around. If you like to give the child opportunity to see them around, you have to use sunscreen and may hold off purchasing a helmet having visor until he becomes older. A chin strap may irritate the skin of the infant as they have sensitive skin. Helmets come with having pads. The result is that the child feels soft for having straps on the baby’s skin. You should be sure that the chin strap must be fit for the child for whom the helmet remains tight as well as secure to the baby. If the clip chin strap along with, it may pinch the skin of the baby. Therefore it is better to buy a strap having pinch guard. If my child likes to use a bike to ride or would try a new one, he must have to use a helmet. He decided to pick up a new one instead of the old one. I have good faith in belts, and the helmet is truly used. It fits over his head snugly. It has two reflectors on the back of the straps. The straps aid to make the adjustment well. The strap holds wrap to wrap extra strap along with well padded. The clips are added here to save from the pinching and are curved to the face. I am very happy. My two years old child likes it very much. He is safe enough to wear it. To see well it has high reflectors. This helmet is a cute helmet for the toddlers. I have bought it for my two-year-old grandson. We have bought him a strike for the Christmas. He loves Mickey, and its color is vibrant. The foam of the helmets inside is very sturdy. The shell is also made from strong plastic. The helmet is perfect for this tumble boy. It has a nice open vent over the top of the head so head may not get very hot. The straps are adjustable so fit for a couple of years. Be confirm; the baby is safe enough by wearing Giro Me2 helmets. The helmet is designed well as it has very colorful and fascinating size. There are other features like aviator pigs, red duck, goose, pink bunnies, and yellow chicks. It has twenty vents to keep the head cool for the child. In Giro’s Mini Loc fit you will get simple strap guide which enables ensure that there is no pinch over the head of your child. It had soft pads inside and made in the visor for ensuring shade. The helmet is fit and aids your child to grow well. The helmet is fit for the child having headed measuring 18.75 – 20.5 inches in diameters. There is a dial on the back by which you can tighten the helmet easily. See it is very easy to over tighten. In the back side of the helmet, there is an adjustable band. I like this option very much. I have not viewed it before in any helmet. You can easily use the turn knob that adjusts the bands around the back of the head. For this case, you can use the helmet loose, and tight down the points which you child fails to remove. It sits easily on the toddlers’ head, and you can easily adjust the straps. You are sometimes failed to use the helmet as it is very snug. Dial Easy Fit Retention is having comfortable over the fly adjustment. Pro-Rider Classic Multi-Sports Helmet fulfills the standard of CPSC and helmet safety. Skate style design is composed of the hard shell along with vents positioned to the top, back and front of the helmet. The helmet is made for outdoor activities like inline skating, biking, skateboarding, BMX riding and roller skating. SIZE CHART: Wrap a measuring tape around your head to see the head diameter, start it from an inch above the eyebrows and encircle the widest part of your head. Classical Multi Sports Helmet with having the hard outer shell for ensuring more protection complies with CPSC standard for the safety of the helmet. Ventilation channel to ensure cooling comfort. Function well. All kids’ helmets which are flatter in the rear of a trailer would still tip head forward. Not only that the modification in the rear works barely enough. As she gets older- about 20 mo- she can easily let her helmet through the jaw strap is adjusted. I censure the adjuster to the back; it is scooped enough round the bulge to the back of the head. On one side there is a plastic bag holding, and on other side pet hair, it’s foam pads are ripped open. Be sure, your kid will get pleasure and safe ride along with the Giro Me2 bike helmet. There are lots of colorful designs such as aviator pigs, yellow chicks, goose, red duck and pink bunnies. The helmet comes with 20 vents to keep the kids head cool. The helmet comes with simple strap guides. The Giro’s Mini Loc fit system enables your kid to wear the helmet except pinching skin. There are soft pads inside the helmet to give more comfort. Moreover, it has visors to give a bit of shade. The helmet is changeable meaning that you can use the helmet to raise with your kids. It is fit for toddlers and infants who have head measuring 18.75 to 20.5 inches. If you like to use the helmet clutch the helmet with 2 hands before a mirror and twirl it to the right and to the left. When you get the helmet is right well, the forehead and the skin move as helmet shifts. If you see it is very loose, then the helmet isn’t safe for you. You should better to readjust it. Parents can easily tighten the helmet to the back by the help of a dial. Nevertheless, watch out as it is over tighten. The strap of this helmet is very hard to adjust. Moreover, it seems to hang loose. Therefore you can’t use it for your 1-year-old daughter. The Lucky Bums Sports Helmet has lots of features that you want in a helmet with affordable price. This helmet is durable, stylish, functional and comfortable. There are 2 protective layers, goggle loops and a padded chin strap with this helmet. Take it out of the box and choose your desired color and size. Additionally, it has 2 reinforced layers. The outer cap is made of a rigid ABS material. It is covered by a supportive EPS outer shell for double protection. The padded chin strap and added goggle loop give more function and comfort. The helmet fulfills the standards of EN1077 and got CE certificate. There are interior fabric lining and ear padding inside the helmet along with a hypoallergenic and antibacterial treatment. Besides, ESP inner shell has multiport with web screens to ensure more flow of air. One can use this helmet for the whole day with great comfort. Each includes a micro adjustable strap to ensure well fitting for everyone. There are 4 different sizes of them you choose your right one. Internal plastic confines the helmet to ensure proper fitting for the child inside it. The different child has different head sizes. The internal adjustment system is very useful. This feature helps more to keep the helmet in its place and ensures better safety. There are some helmets which have no interior adjust system. You may get different types of interior adjust systems for the youth and the child. There is a dial set to the flipside of the helmet. It helps to fit the helmet well on the head. When you turn the dial, the internal cage gradually adjusts well on a child’s head. There are few sizes of helmets on the market. So it isn’t difficult to select a well-fitting helmet. Conventional dial regulates systems are available on most of the high-end helmets, such as Bell helmets, all lofty end Giro helmets, Melon and Nutcase. Most low-end bicycle style and skater-style helmets don’t have adjustment system. Instead, all come with pads of different thickness. Before buying a helmet, parents must give importance to the breadth of a pad to get a cozy fit. Many parents can’t choose the right helmet. They buy poorly-fit helmets which rarely remain in places. Moreover, you have to buy re-adjustable pads as your child is growing gradually. There remains no space in skinny sized pads. So day by day, pad-adjusted helmets are being challenged to adjust accurately. The Giro Dime is considered rare pad-adjusted helmets which we suggest you. Lazer Self-Adjust: Lazer’s single Autofit system fits on the wearer’s heads easily. The system adjusts through a tension cable, encased within a plastic housing. The housing allows the interior cage of the helmet to increase to fit well on child’s head. Always choose the best fitting. The Autofit system adjusts well on the head of the users through the child likes to puts it on them. There are 2 kinds of helmet building. These are hard shell and in-mold. Both types of constructions ensure enough safety if you face a crash. There are lots of vents here. All are long durable. The only difference is how the external plastic defensive shell is made to foam core with the helmet. The inside foam and the surface plastic shell are compound jointly in-mold helmets. The combining system allows for more vents typically provides complete weight. The exterior plastic shell of the helmet may not crack as it is complex too with the foam core. This helmet has a very thin plastic shell. So the in-mold helmet isn’t allowed using the skateboard. This is ensured by ASTM standard. All higher end conventional helmets are made with in-mold construction though there are few skater styles. Melon helmets are building with an in-mold system. Therefore these helmets are lightweight than the skate helmets. For this reason, these helmets are not permitted for the skateboard in the US. Two kinds of hard shells are used to make the helmets- these are the skater-style and lower-end bicycle helmet. A thick plastic shell is added with glue to the lower foam to the center of the helmet. The thick core needs for ASTM skateboarding. It allows durability and multiple collisions for skateboarders. On the other way, a thin plastic is taped with the foam core to make a lower end hardshell helmet. The problem is that these thin shells normally crack, warp, come off, and ensure short durability. Keep the eyes of your kids from the sun will surely give more comfort to them. The riding experience will be more appealing. Most conventional helmets are made with clip-on or built-in visors. It is true that the skater style helmets have no visors. On the pre-school helmet, built in visors is the generally common thing. Helmets for youth come with snap-on visors to give more protection from the sun. There are small visors also with some helmets like Nutcase. Fitting exactly is a must for ensuring safety. So measure the toddler’s head inaccurate size. As more the setting, move the safety. Do not purchase a helmet for the child to grow up into says RN, Rene Hopkins a child safety investigator in Augusta, Ga.
Keep the helmet in such a way that it remains low on the head of your child about two finger widths on the eyebrow. If she looks up, she could only see the frame of the bike helmet. Adjust straps of bike helmet in such a way that it looks like V beneath the ears. If buckled beneath the chin, it should fit cozily, and more than 2 of her fingers may fit under the strap. Stir it, baby. When the helmet collapses, after all, added straps for tighter fit. How Do You Know a Helmet is a Real Deal? Lots of helmets are sold in the United States having uniform safety standard approved by the U.S. Consumer Product Safety Commission. These helmets are being sold worldwide with reasonable price. Many of the famous helmet manufacturers are now giving more importance to safety by incorporating a Multi-directional Impact Protection System (MIPS). The slip plane size permits the energy to be absorbed from the crash impact by the helmet regardless of angle and direction of, the impact. The prices of the helmets having MIPS are bit higher, but parents are happy with it as it gives extra safety for the parents. For this reason, they are happy with the helmet though the price is higher. Here you will see a video of MIPS helmet in which you will see how this type of helmet works. Concerning brands, Start Looking for Lazer, Bern, Bontrager, Giro, and Specialized New helmets, suggest Both Wheeling Tots and the A Child Bookmarking Sites. A couple of versions of Bell brand helmets. Even while they tend to be more affordable than other manufacturers, can also offer adequate protection to your toddler. The top helmets for toddlers will probably be as lightweight as you can your toddler can not hold up a great deal of weight along with his small head. Besides it’s had a back stabilizer close to the rear of the mind which will keep the helmet from sliding around. Helmets should also fit snugly and sit a couple of fingers above the eyebrows with minimal slippage into the right, left front and rear, reminds the National Highway Safety Traffic Administration. Question: Why would a child use a toddler helmet while biking? Answer: The answer is straightforward. Pure security. When a child drops out of a bicycle when riding it as a passenger, then the initial part to strike the floor is your mind that might cause acute injuries. Question: Why is it essential to wear a helmet? Answer: Helmet is your primary line of defense. We cannot stress enough about the security aspects of your child while on the bicycle. No matter how carefully you’re tracking your kid, accidents can occur and lead to significant injuries for your child. To avert such damage, we strongly urge children to utilize toddler helmets while on the bicycle. Question: Can it be against the law to ride a bicycle without wearing a helmet? Answer: There are stringent laws set up in 22 countries, to put on a helmet while on the road. It’s very similar to wearing a seatbelt when driving. Question: Do toddler helmets reduce head injuries? Answer: Yes, indeed it will reduce the possibility of death. 75 percent of accidents involve head injuries. By wearing a helmet that might lower the harm caused during mishaps and help for faster healing. 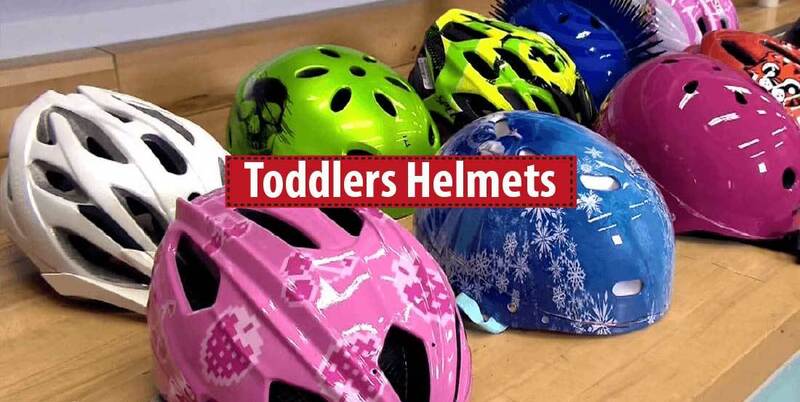 Question: How can helmet shield your toddler’s mind? Answer: Well it’s better to not crash in any way. However, at the worst circumstances, should they do, better wreck using a helmet since it consumes 90 percent of the pressure resulting from the impact throughout the wreckage and can lessen the chance of fetal death. The harms brought on by wearing a helmet is a great deal lesser when compared to wearing no helmet in any way. Question: Why are bicycle helmets shaped the way they are? Answer: The toddler helmets are a ring in shape to match the form of the mind and is aerodynamically designed, so fewer atmosphere pollutants enter the helmet and don’t get in the way in a crash. In the event the air pollutants arrive in the manner during effect, it produces a force known as drag and leads to severe injuries to the mind. Question: Why do toddler helmets perish? Answer: Not really, unless it’s damaged or worn out. They may be used for a long time to come. Question: Why do toddlers need helmets on bicycle trailers? Answer: Yes course, since they’re still on their bike in the back and may fall off. To see the brands, search bell, laser, Giro, Bontrager and special brand helmets indicates the 2 Wheeling Tots and A Child Grows websites. Some Bell brand helmets are less expensive than the other brands in the market and give more protection for your toddlers. For toddlers, choose the lightest one. You, toddlers, cannot endure more weight on its little heads. The helmet has a stabilizer near the head which will resist the helmet from sleeping down from the head. The helmet should fit one or 2 inches above the eyebrow, little slippage to the right, reminds the National Highway Safety Traffic Administration, left or front and the back.